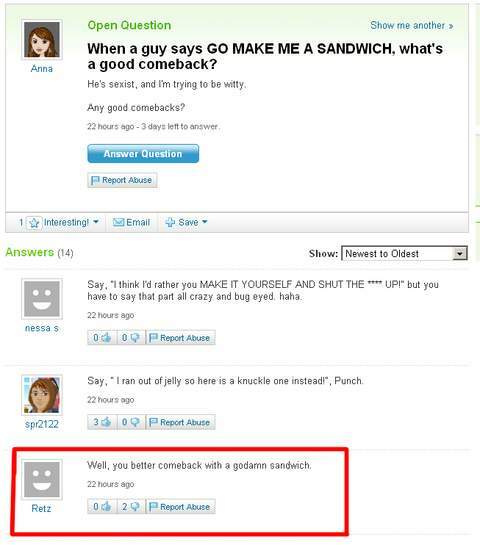 When a guy tells a girl "go make me a sandwhich" whats a good comeback? "hold on, wait until I try and google a good witty comeback to that highly sexist remark but when that doesn't work can you hold that thought for however long it takes some from yahoo answers to give me a suitable alternative?" That'll put the sexist pig firmly back in his place sister. Learn to spell is a good one. Girl: Why, haven't you got hands? When a guy tells a girl "go make me a sandwhich" whats a good … When a guy tells a girl "go make me a sandwhich" whats a good comeback?Learn to spell is a good one. If my woman made me wait 4 days for the internet to tell me a comeback to my sandwich request - she'd be gone. And i'd order a sandwich from somewhere . . .
lol. why wasn't she in the kitchen! If my woman made me wait 4 days for the internet to tell me a comeback to … If my woman made me wait 4 days for the internet to tell me a comeback to my sandwich request - she'd be gone.And i'd order a sandwich from somewhere . . . Guy: Wut?...hold up...where the **** is my sandwich! ?